You know a lot of the songs here are available on Cardiacs Archive, right? 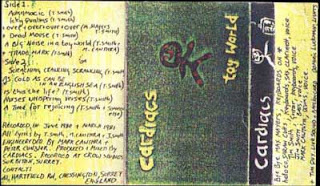 Also, almost all of the tracks on this and on the Cardiac Arrest tape are available in great live versions on the Special Garage Concerts, which are very high on my list of favorite Cardiacs releases (that list also includes Sing to God, Guns and A Little Man and a House and the Whole World Window, and of course the rest of their records, and the Spratleys Japs records, and the Sea Hags record, and...). I had no idea "Nurses Whispering Verses" was so old! It's been one of my favorite Cardiacs songs ever since I first heard it on Sing to God, mostly because of the way it ends. I'm even more impressed to know it's from so early in their career – Tim's a genius! It's hard to put into words just how much I love the Cardiacs. Thanks so much for posting this! Just a note to say, am an avid follower of your blog, sometimes things creep into my Brussels radio show. You asked for requests, OK so here it is, mostly stuff made by Martin Kippenberger along with Albert Oehlen, some on Oehlens label 'Leiterwagen', think it is defunkt now. The Jailhouse & J.B. Slik things are fantastic. I only every seen the Z Records 7"s a few times going for between eighty to one hundred euro on Ebay. Pockets not that deep... I am afraid. This is unrelated but do you have any of Cerebral Hemorrhage's albums (i.e. Other Worlds or Sticks And Stars)? Great posts as usual and thanks! 'Sea Hags record'? What's that? Agreed, everyone with any interest in these primitive sounds should try to hear the Garage Concerts.